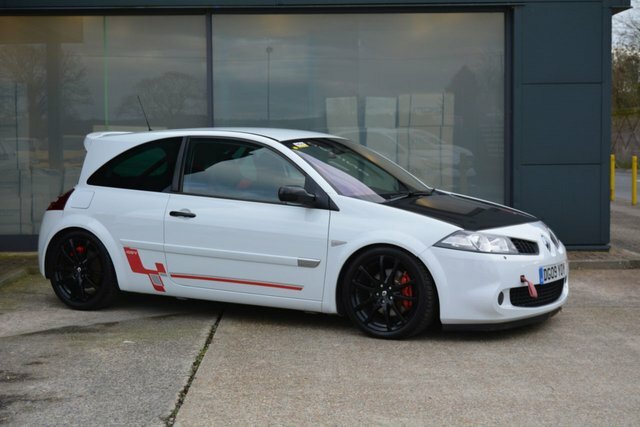 Here we have a very unique Megane R26.R which we have for sale on behalf of a very good customer. This car has been recently upgraded with track performance in mind and features superb specification which includes an engine rebuild with forged pistons and conrods, uprated valves and valve springs, Gripper differentail, hybrid turbo, alloy intercooler, lightweight R26.R flywheel and clutch, induction kit, 630cc injectors, full stainless steel exhaust with sports cat, ecu remap, uprated brakes and AST coilover suspension. This R26.R features the rear roll cage along with air conditioning and is supplied with a full service history including recent cambelt change and it is MOT'd until January 2020. For more information please get in touch. Fully tailored low rate finance packages available with low deposit and up to 5 year term, please contact us for more details and a no obligation quotation. Warranty extension from our standard 6 months to 15 months from just £149, please contact us for more information. All cars Experian Auto Check clear.